His given name was Edward Frederick Babbage, the son of John and Frances Babbage, who emigrated from England in the early 1800s and settled in Rochester, New York. Among their five children was a pair of twins, Edward Frederick and Edwin Francis, born about 20 miles west of the city in 1841. Early on, Edward exhibited a propensity for gaining weight. He was considered large at age six, and weighed 200 pounds when he was fourteen. By his early twenties, Edward had worked as a hotel porter, hotel manager, traveling salesman, museum manager, and glassblower (he was lead agent for a group of glassblowers performing at various venues). 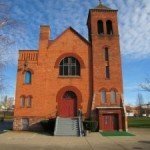 After the Civil War ended, he returned to Rochester. A number of veteran soldiers formed a minstrel troupe (again, politically incorrect), and Edward worked successfully as their road agent for three years. 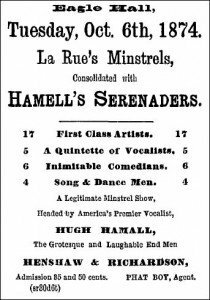 When minstrel performer and organizer “Happy Cal” Wagner needed an agent, he dispatched a telegram to Babbage in Rochester. Unaware of Edward’s first name, Wagner addressed it to “Phat Boy Babbage.” The nickname became Edward’s public identity, and for the next several years, he traveled the country, representing various minstrel shows (including Wagner’s) and other performers. For more than a decade, Edward traveled to every state in the country (there were 37 at the time) and claimed to have visited every city or town of more than 5,000 residents. His travels included stops in northern New York and southern Quebec, where, in the early 1870s, he recognized an opportunity for promotional work of a different sort. The spectacular scenery of the Thousand Islands area attracted thousands of travelers annually. During the summer months, Edward began working as a tour guide on the water. It was there that he became a North Country legend. 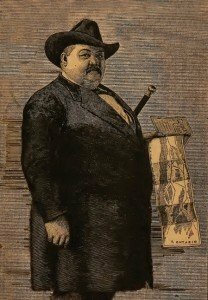 Steamship companies sought his services, and Phat Boy himself became one of the area’s great attractions, holding court while seated in the bow of the boat, and always wearing his two signature items: a felt hat with a large brim, and a diamond pin on his chest. As individual islands were passed, he spouted (there’s another one) their history, interspersed with colorful stories and plenty of humor. Edward became well-versed on the background of sites from the Great Lakes to Montreal, plus Boston, New York City, the Hudson River Valley, and Lake Champlain. He eventually put it in writing, and for more than a decade, a new version of his booklet appeared each year, with the title and text modified. One of the later editions was The Phat Boy’s 15 Years on the St. Lawrence River: The People I Have Met and the Things I Have Seen. For 25? each, Babbage sold thousands of copies to his followers. In the text he addressed his physical size, warning others that being large wasn’t always so great, and that he often couldn’t fit into common spaces designed for average-sized people. As always, the passages were laced with humor. He also told of encounters with famous people, many of whom sought him out for his own fame as a guide. Among them were President Grant, George Pullman (of the luxurious Pullman rail cars), Mark Twain, Sir John A. MacDonald (Canada’s first prime minister), and members of various royal families. Others too numerous to mention were captains of industry, including many who owned St. Lawrence River islands that were part of his tours. For all the references to his weight over the years, Edward carried it well. 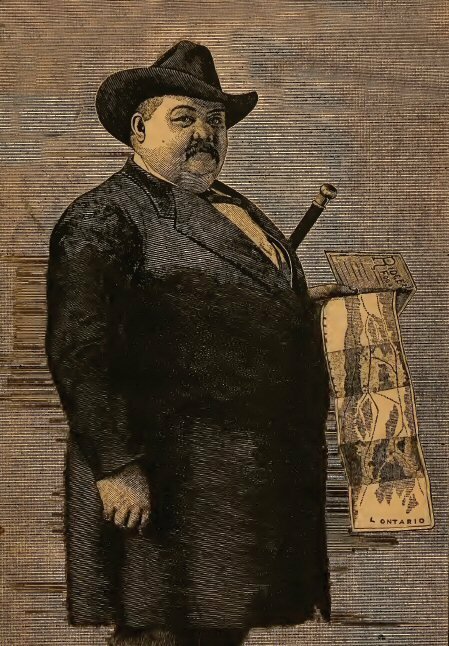 Unlike in modern times, well beyond 300 pounds was considered substantial for his era. Yet the consensus held that Phat Boy’s great bulk was dwarfed by his bigger-than-life personality. He was invariably described as congenial, obliging, and very funny. Which all combined to make him a hit on the St. Lawrence River boat tours. He worked hard to learn the region’s history, an effort reflected in another, more flattering, nickname: the Bureau of Information. 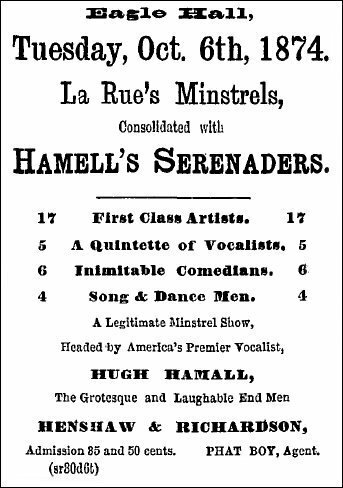 By 1890, more tours and stories were added to his repertoire. From his storytelling perch in the bow, he often referred to his weight as 333 pounds. His wife, also very large, had died a few years earlier, and their daughter was heavy as well. Edward’s twin brother, Dr. Edwin Babbage, was said to have lagged behind him, weighing only around 300. At Alexandria Bay on the evening of June 30, 1891, Edward didn’t feel well after a full day’s work. A popular guest at the Marsden House, he informed employees of his infirmity and headed for his second-floor room to rest. Though he whistled a tune while climbing the stairs, pain suddenly overtook him. After calling out for a doctor, Edward fell at the head of the stairs, dead. He was 51. Mourning ensued up and down the shores of the St. Lawrence. The flags of several boats and islands were lowered to half staff in his honor. Edward’s guidebooks, maps, and some great memories eased the loss, but nothing could replace the man who had spent 18 years on a job he truly loved. Eight months later, his twin brother Edwin, who had been ill, died similarly, collapsing on the streets of Rochester. ← Online Essay Writing: Nothing Can Prevent You from Ordering with Us!